CONGRATULATIONS!!! You're Gold Monkiac* to visit this site since March 21, 1996! OFFICIAL REGION 1 DVD SET COMING JUNE 8!! Fabulous Films, in conjunction with Shout! Factory, will be releasing a Region 1 NTSC encoded DVD set of the complete series June 8, 2010! The set includes the complete series -- The 2 hour pilot movie and the 20 subsequent hour long episodes -- uncut. Extras include: a brand new 36 minute "Making Of" documentary featuring Stephen Collins, Caitlin O'Heaney, writer/producer Tom Greene and director Harvey Laidman, episode commentary by Tom Greene (5 episodes); series synopsis; stills gallery; Caitlin's original costume gallery; artefacts gallery and a 24 page Collectors Booklet. You can pre-order it now at the Shout! Factory Store for just $32.99! For fans outside of North America, Fabulous Films has already released a Region 2/4 PAL encoded, 6 disc set in the UK, Australia and New Zealand. 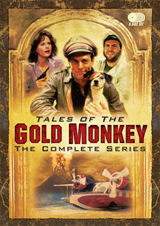 Tales of the Gold Monkey-The Complete Series is available for order from Goldmonkey.com for just US$49.99! The set includes everything listed in the Region 1 set. Shipment will be directly from Fabulous Films in the UK via airmail. IMPORTANT: The Region 2/4 DVD set will not play on most DVD players sold in the US or Canada [Region 1]. This item requires a region specific or multi-region DVD player and compatible TV. FREE WORLDWIDE SHIPPING at the Goldmonkey.com store. You read it right! Free shipping to anywhere in the world. 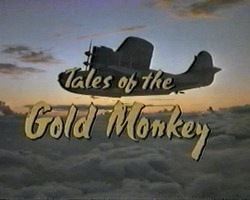 Choose from about 60 rare, retro TV series, including Tales of the Gold Monkey, naturally. These items are also available at my iOffer store. If there's a show you desperately want, but can't find in the store, please drop me a line and I'll try to track it down for you. Show your support for classic TV and this site! The money you spend helps keep this site up and growing!! What's a TV show fan site without video. The Pics Page now has some Real Video clips from the episodes. And now you can see those video clips and more on my You Tube channel. If you'd like to see something specific, let me know and I'll try to make it happen! Along with every script, the Episode Guide now has 48 (96 for the pilot) corresponding pictures. Just click on the PICS link! The Oklahoma Film Society held a 3 day workshop June 25-27, 2004. The event had a Gold Monkey theme. 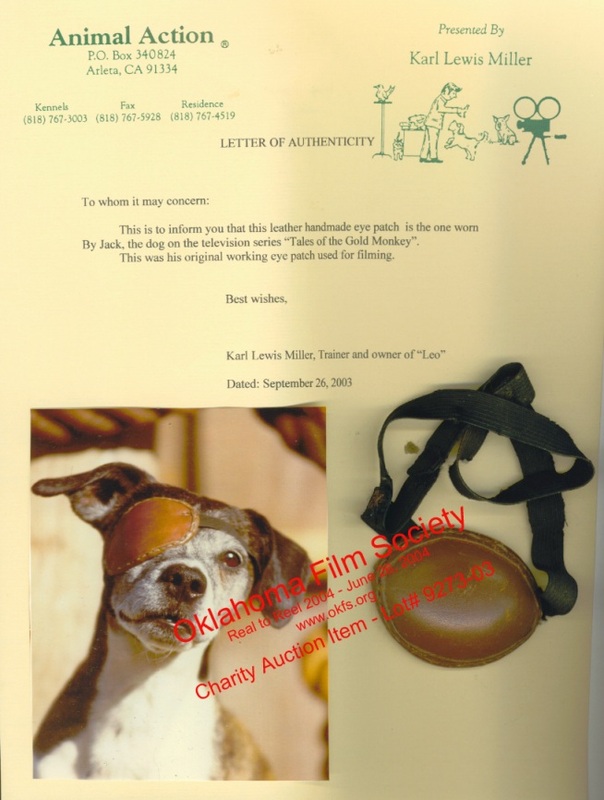 They held a charity auction on June 26 which includes Jack's eye patch. Click for EVENT FLYERS. First hand accounts of the seminar will be forthcoming. Action, drama, comedy, romance...and a one-eyed, talking dog! Yes, folks, it's Tales of the Gold Monkey, that TV cult classic from that totally bitchin' period known as the early '80s. You remember the high-flying adventures of Jake Cutter, TV's best answer to Indiana Jones. You watched it. You liked it. Oh, yes you did! Otherwise, you wouldn't be here, would you? The odds are you're part of that generation that "came of age" (God, I hate that phrase) in the early '80s. You listened to Duran Duran and Men at Work, wore your collar up, moussed your hair and had a collection of buttons (you know, those stupid pins you put on your jacket, your purse, etc.). And you used to watch Gold Monkey 'cause it was wicked cool. Don't be ashamed. Be proud. Be strong. Just keep repeating "Yeah, I liked Tales of the Gold Monkey. You got a problem with that?!" Don't you feel better? First, let me just say that this is a totally UNOFFICIAL web site. I have no affiliation with Belisarius Productions, Universal Studios or any another organization or individual who had anything whatsoever to do with the series (I hope that satisfies those legal types). I'm just a nostalgic, Gen Xer with an excellent memory and way too much time on my hands who has seen the need for this site, judging from the traffic on the Net about the show. Yep, the '80s are back and they're better than ever (Reagan's gone, for one thing). A FACTS PAGE with series information, cast list, synopsis and "fun facts". And thanks to director, Harvey Laidman, we also have "official" facts, like the show "bible" and Jake's history. My attempt (a very good one) at an EPISODE GUIDE complete with guest star, writer and director credits and my witty commentary. Plus, I've added the text to the original scripts to the episode guide. Just click on the episode title to read the entire script. After you read the script, you can look at the thumbnail pictures captured from every episode by clicking on the episode PICS link. Bulletin boards for questions, comments and all-around chit-chat about the show and/or this web site. (It's all right. I can take constructive criticism.). You can now access the BULLETIN BOARD LISTING to check out our ever-growing number of "(Gold) Monkey Houses". And you can also "chat" with Gold Monkey cast and crew members on the boards. You can check out notes from Stephen Collins and Jeff MacKay starting on Bulletin Board #3. First appearing on Bulletin Board #4 are Harvey Laidman and writer/producer Tom Greene with all sorts of "neato stories" from behind the scenes. And Caitlin O'Heaney has popped in, starting on Bulletin Board #5. Questions are very much welcome. A PICS PAGE with a long list of various shots to choose from. Plus, Jeff MacKay has kindly sent me some of his personal photographs from the making of the show. Also included on the Pics Page are WAV files, including the THEME SONG (661K). Thanks to Karen McLean for all her help with teaching me the magic of audio technology. And now at twice the size, but 10 times the quality, it's the THEME SONG MP3! But wait, there's more! We now have Real Video clips from most of the episodes. The TALES OF THE GOLD MONKEY ANNUAL, first published in London in 1982. The book includes articles, stories, cartoons and lots and lots of pictures. Thanks to Leanne Shawler for unearthing this little treasure from her recently arrived belongings from Australia and Lesley Pohl for her help in scanning and transcribing. You asked for it. You got it! We had a GATHERING to celebrate the show's 15th anniversary in September 1997. What?! You weren't there? Well, you missed one helluva time. But fear not. We have pictures, audio files and stories to share. Check it out! Over six years in the making!! After many promises and lots of typing, I finally have uploaded the CUTTER'S GOOSE FANZINE I got from Marilyn Victor (nee Johansen) back in 1996. All I had to do was just breakdown and buy a fancy-schmacy scanner and put the whole thing up in PDF format in 2 days. Then in one more day, I was able to upload CUTTER'S GOOSE 2. Check out the (nearly) complete collection of Tales of the Gold Monkey comics from TV COMIC, published in England in 1983-84. We used to hold regular IRC chats, but these chats have now been relegated to "special" status. For more information and to read all the logs to all the really cool chats you missed, check out our IRC CHAT LOG AND SCHEDULE. And thanks to Len Warne, we have a scholarly GEOGRAPHICAL MODEL, detailing the geography of the Marivellas. And if all this isn't enough to satisfy your Gold Monkeymania, then you can own the series on DVD! Just stop by the Goldmonkey.com store or the second location at iOffer to see what's available. Remember that this site is a work in progress. If anybody has contributions (trivia, pictures, etc. ), please e-mail me at gmonkey@goldmonkey.com. Not only will I use almost anything you send me, but I'll even give you credit. That's just the kind of generous person that I am. P.S. I'm sure there will be a few of you super fanatics out there who object to my less than reverent tone. The only way I can answer you folks is to quote William Shatner from a November, 1986 skit on Saturday Night Live. "GET A LIFE, will ya, people! I mean, for crying out loud, it's just a TV show." Of course, he was referring to Star Trek, but the principle's the same. So you want to know all out Stephen Collins' career, eh? Well, get the details from the man himself at http://www.stephencollins.com/. John "The Gneech" Robey - the man, the myth, the legend. Get inside the mind of this mad genius by reading his home page. Learn about his unrequited love for the Grumman Goose. And prepare to be astounded by his creation, Astounding Adventures Quarterly. Take a trip to the Pacific Northwest by checking out Seattle Seaplanes, the current home of Cutter's Goose. Jeff "CRASH" Goldin - yet another Goose aficionado. Rae's Personal Potpourri - Rae was kind enough to put a link to this site on her page, so I felt I should return the favor. And you can check out the home pages of two of our favorite Monkiacs, Karen McLean and Leanne Shawler. Also, stop by and join Karen's fantastic Official Stephen Collins Appreciation Society. Harvey Laidman is a man of many talents. He not only directs TV series, but he's created his own web site, OutaDaLoop. Read all about Stephen Collins' latest TV series, 7th Heaven. If you love Tales of the Gold Monkey (and who doesn't), then you may want to check out these sites for shows that Mr. B. has had a hand in. *Bellisario stepped down as Airwolf executive producer in 1985.